We provide a full array of services designed to meet the needs of each resident. Food Service - Three delicious meals served daily, plus snacks and beverages. 24-Hour Personal Assistance - Staff will assist with dressing, bathing and grooming as needed. A licensed nurse is on duty or on-call at all times. Housekeeping - Provided weekly. 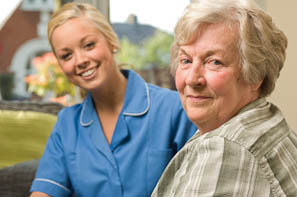 Residents remain independent by performing day-to-day tasks with assistance as needed. Laundry - Laundering of personal clothes and linens is provided weekly. Utilities - All utilities supplied. Telephone and cable TV are individually contracted directly with respective companies. Medications - Monitoring of medications with pharmacy delivery available. Activities and Programs - Socialization and physical exercise encouraged through planned activities. Memory Impaired Care - A special unit that provides more closely supervised care for those that need it. Transportation - Coordinated for medical appointments. Maintenance - Building, grounds, and equipment maintained without worry to residents. Special Therapies - Physical, occupational, and speech therapies coordinated through outside providers. Beauty Shop - Services available, for a reasonable fee, on a weekly basis at on-site beauty shop. Look through our list of Frequently Asked Questions.